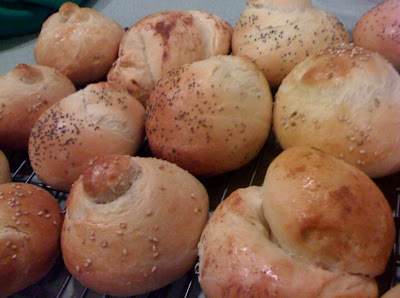 These Challah Rolls were made using a recipe out of our synagogue's cookbook, Can't Believe it's Kosher! They are topped with: poppyseeds, sesame seeds, honey, and cinnamon sprinkle. Place 1/2 c warm water in bowl with yeast and 1 tbsp sugar. Let sit for 10 minutes. Add 2 c flour, eggs, sugar, oil, and rest of water. Mix well. Add half the flour. Mix and let stand for 10 minutes. Allow dough to rise for 1 hour or until doubled in size, punch down, rise for another hour (I'm not sure it's necessary to do the second rise... thoughts?). From here, you can make a dozen to 18 rolls. I roll out and tie in a not with the little nub on top. Let rise again (the recipe says an hour, but I only do like 20 minutes because I'm usually running late before Shabbat). Top with egg wash and any toppings you like. I like a little cinnamon but it tends to make a very hard glaze. I'm still working on a better method. While I'm not crazy about this recipe a few days later (it gets a little tough), it freezes really well, and the rolls tastes wonderful with a little low temperature microwaving or an overnight thaw. Plus, it helps The Hazz and I with portion control... we could easily eat two full challot meant for a dozen people in one evening.